Directed by Alex Proyas (The Crow), and shot entirely in Australia, Dark City is a futuristic thriller about a man who discovers that his memories are implants. Shades of Total Recall? 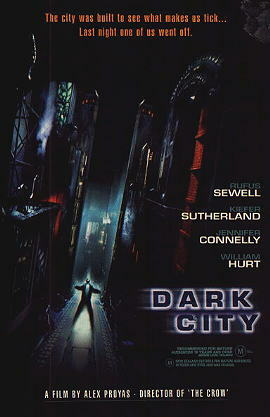 Dark City is a dark movie, from the lighting, which is stuck in it's night-time scheme of things, to the content. It plays with the philosophical concept that we could have been put here at this very second with every memory we have being implanted so we don't think anything is wrong. This is a very imaginative and well put together film, from the director of the first The Crow movie, Alex Proyas. Filmed in Sydney, you could never tell, with the exception of a few location shots. The cast is a wonderfully diverse affair with Terrance Stamp and Richard O'Brien and Rufus Sewell representing the English; William Hurt, Jennifer Connelly and Keifer Sutherland (playing a role based on one of the most famous madmen in history, Dr Schreber) for the Americas; many Australian extras with Colin Freils, Bruce Spence. If you blink you'll miss Paul Livingstone (aka Flacco) with his one line of dialogue. If there was one thing I think the movie could have done without, it would be one of the special effects. For the most part, everything that happens in the movie is spectacular and well crafted but the inclusion of the Strangers "real form" on film was sort of a distraction from the rest of the movie, and everything could have still gone on perfectly with out it. Watch it with the lights out.